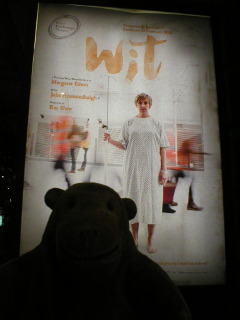 Mr Monkey caught a bus into Manchester for the press night of Wit at the Royal Exchange Theatre. Margaret Edson wrote Wit sometime after she stopped working at the AIDS and cancer research wing of a hospital in Washington DC, completing the first draft in 1991. Edson's only play to date, Wit was first performed in 1995 and won the Pulitzer Prize for Drama in 1999. 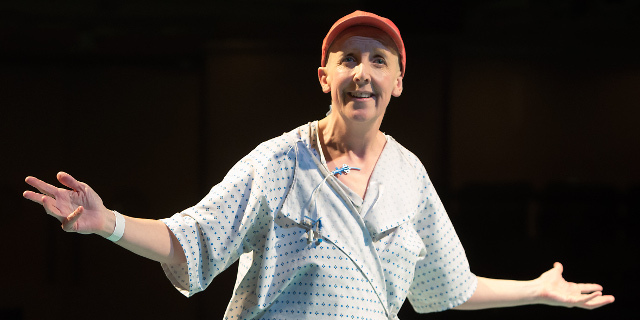 Wit is a harrowing dramatisation of the last days of Doctor Vivian Bearing PH.D., who is suffering from an ovarian cancer which was left undiagnosed for too long. Due to the extent of the disease and her belief in thorough academic research she has chosen to be treated in a research hospital. Here she is under the care of a pair of doctors who are basically experimenting to find out how much chemotherapy one woman can take. Throughout the play Dr Bearing lectures the audience on the minutae of her treatment, and of various important parts of her past. This leads her to reflect upon on how she has led her life. Scenes of the chemotherapy process show changes in the relationships between the research staff and the nursing staff. Mr Monkey also learned quite a bit about the metaphysical poetry of John Donne. The set is simple to the point of non-existence, just a clinically green circle raised in the centre of the acting area. As you'd expect from the Exchange, furniture rolls in and out as necessary. The hospital effect is heightened by the sheets of fabric that hang around the windows of the theatre pod. Julie Hesmondhalgh is absolutely brilliant as Dr Vivian Bearing. Her American accent is convincing, and her acerbic and witty style provide an unexpected amount of gallows humour in the face of an increasing feeling of impending doom. Her outstanding performance grabbed Mr Monkey from the first word and held him captive until the lights went out and it was time to stand and applaud. She is ably supported by Jenny Platt as Susie Monahon and Esh Alladi as Jason Posner as the two members of the medical staff who have regular contact with her; one views her as a person, the other views her as a high-functioning lab rat. 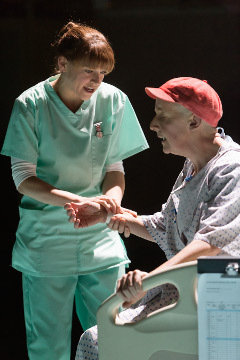 As a whole, the cast produce an on-stage hospital painfully familiar to anyone who has had to visit anyone in intensive care. Mr Monkey was very impressed with a couple of finely choreographed slow motion sequences. Mr Monkey found this production of Wit rather harrowing (and he wasn't alone), and he recommends it as a grim but satisfying night out. He strongly suggests, going by the reaction of his humans, that it would be a good idea to take a lot of tissues and to be prepared for a kaleidescope of extreme emotions. It's a truly outstanding production. Wit runs until 13th February 2016.